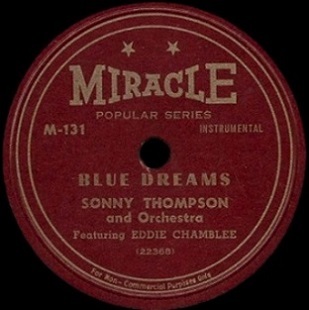 When Miracle Records brought Sonny Thompson into the studio as often as possible at the tail end of 1947 to cut enough material to get them through the upcoming recording ban they had no idea that rock ‘n’ roll was about to break wide open and it’d be that newfound raw and urgent style that would be what younger listeners clamored for in the coming months. One look around the marketplace at the time had given little, if any, indication that this recent underground trend would take off in any sustainable way and even the slight buzz rock had managed to produce in some quarters to date was hardly enough to make typically conservative record companies throw their fate in with something that seemed to be at best a minor commercial entity. Even when artists themselves, like Thompson who had their finger on the pulse of this growing innovation, were intrigued by its possibilities enough to give it a whirl, they too were far from convinced it’d be their salvation. So with everybody unaware of what styles would be commercially dominant just over the horizon Miracle Records had Thompson record a wide variety of material that allowed him to explore this new type of music to satisfy his own artistic curiosity on one hand, but on the other hand also made sure that they played it safe by cutting him on plenty of reliably predictable sides that looked back at the recently popular – but now rapidly waning – swing motif. Throw in a few other songs that sort of took the middle ground between the two approaches and they figured they could get by with that for the foreseeable future, whichever trend wound up taking off. But when it was rock ‘n’ roll that exploded in 1948 with Thompson at the forefront thanks to his grooving instrumental Long Gone, suddenly all of those other songs from different styles they had in the can were deemed all but unusable… at least until they were left with no other options. With that first hit still riding high in the summer of 1949 Miracle Records released Late Freight, the remaining rock instrumental from Thompson’s late 1947 sessions and were rewarded when it too hit #1. But that was it, their limited supply of comparable material was now exhausted and they had no clear-cut rock sides left to put out. Making matters even worse was the fact that Thompson had cut both of those tracks with the addition of saxophonist Eddie Chamblee, who was not a member of The Sharps & The Flats (the group enlisted to back pianist Thompson), but rather was an unaffiliated session musician in his own right who just happened to be paired with them for a few recording dates, and it was his contributions which had helped to shape the now defining sound of not just Thompson’s work, but the rock instrumental style itself. Though the two had recorded more material together that December it was generally far milder and gave the increasingly nervous label not much to choose from. Wisely they hadn’t wasted another Thompson/Chamblee effort on the B-side of Late Freight, choosing instead to pair that with Sonny’s Return, a song cut without Chamblee, but now in February 1949 they needed to come out with something to keep Thompson’s momentum going, preferably something with Chamblee. Thus it was left to Blue Dreams a song which did in fact feature both men prominently, but which stylistically was radically different than the two hits which had made their names just a year earlier, to keep their winning streak intact. Audiences were glad to finally have a new record to hear and dutifully bought it in enough numbers to have both sides chart for a single week. But considering the previous two records had ruled the Top Ten for months this record’s one and done Billboard appearances showed that listeners were decidedly disappointed in what they heard. That commercial indifference is not at all surprising because this is on the farthest outskirts of rock and we’re really including it simply because its artists have certainly established themselves as rockers and their larger ongoing story requires us to tell of their ups and downs in full. But that said there ARE parts of Blue Dreams that are rather nice. Yet as any rock fan knows “nice” is not the first adjective you look to bestow upon the latest record from somebody who helped define the grittier musical landscape for the last year. If Thompson and Chamblee had set out to record a purebred rocker and came up with this you’d surely take their union cards away from them, or at least banish them to the junior varsity squad and make them woodshed until they got their game back before calling them back up to the first string lineup. But we know this wasn’t the case, like Blues On Rhumba on the flip side, Blue Dreams was something designed for a different market with a different mindset using different musical touchstones than rock employed. Both songs are fairly well played and they each have hints of rock textures floating through them, but the intent was not the same. This music wasn’t meant for audiences to grind against one another in the dark at some smoky juke joint. It wasn’t supposed to put you in a groove. It was – as its title implies – dreamy music for emotional contemplation. Hardly the formula for success in rock ‘n’ roll, then or at any time since. Here Chamblee blows a series of mellow riffs amidst very sparse backing by the others lends a sense of cool detachment to the world around you, as if you were under the effects of some potent weed and just content to watch the passing traffic on the boulevard after dark, the cars lights a blur under the brighter technicolor patterns made by the neon signs over the clubs you’ve been wandering in and out of in search of a musical fix to match your herbal fix. This part, though far from the standard rock approach, works best because it IS so evocative. It might not be conjuring up an image that rock listeners were intimately familiar with, nor wanted to be, but if you let your imagination run wild and allow yourself to give in to its charms you’ll be pleasantly rewarded for your open-mindedness. But then his tone changes, the notes climb into a realm that loses that warmer sensation the earlier passages conveyed and now it becomes less reliant on the overall ambience and more focused on the actual melody which is far too whimsical and lightweight to be of any use to you as a rock fan and thus the spell – already tenuous enough to begin with – is promptly broken. It gets downright flighty for much of the rest of it, saved by just a few all-too brief reaches into the lower registers by Chamblee on his horn that only serve to remind you of what IT’S missing as a song, as well as what YOU’RE missing by spending your dough on this rather than a more suitable Big Jay McNeely record that you passed over in order to stay loyal to Thompson and Chamblee. As for Sonny Thompson, his piano is fine when it’s left in the background to contribute a somewhat quirky accompaniment but when he steps in front for some soloing he falls prey to the same fanciful ideas, his playing becoming far too light and frothy for any deeper connection. Only Arvin Garrett’s guitar passages, themselves more jazzy than we generally recommend on a rock track, retain enough of the vague sense of mystery that gave us hope when Blue Dreams began that it might transcend its artsier intent. It doesn’t, it can’t and it won’t. But mostly it wasn’t intended to and that’s the problem. Actually the REAL problem wasn’t in the music, as inappropriate as it was for the audience, but rather in Miracle Records decision to drag these out of mothballs in an attempt to squeeze out every cent they could from the music they made more than a year ago rather than look for ways to consolidate their advances. Their game plan back in December 1947 was a sensible one. By hedging their bets and cutting sides in every style they felt MIGHT be commercially viable they were only doing what any company faced with a long layoff would do – spreading their resources as wide as possible in the hopes it’d suffice. Then when one style, probably in their eyes the least likely style they’d chosen, turned out to be the winner they made the right choice in terms of their follow-up release. They even smartly didn’t give in to the urge to flood the market with Thompson-led sides in the wake of those two huge sellers, hoping to dupe listeners into shelling out good money for bad records and running the risk of alienating those fans in the process. But now that the recording ban was over and they were free to get back in the studio and cut new, exciting and appropriate material they sat on their hands and watched as every other label made up for lost time and released songs that were pushing even further ahead while Miracle Records inexplicably decided to pull out the remaining tracks by Thompson and Chamblee and think it was going to be able to compete. They got a flurry of initial sales due to audience’s heightened expectations and then were faced with resentment from those fans when the tracks proved to be completely irrelevant to the rock landscape at the time. Your life is largely defined by your decisions, both those you make and maybe even more crucially those you put off. By resting on their laurels and not looking ahead Miracle Records ceased to be a competitive label and within a year were out of business, despite having been so dominant (with just two viable acts, Thompson and bluesman Memphis Slim) in 1948. It doesn’t take much common sense to know that they should’ve had Thompson and Chamblee collaborating throughout the fall when it became obvious the union’s musician strike was about to be settled so that the second it was over they could immediately go in the studio and cut another eight sides that picked up where those others had left off and possibly even improved on the formula. By waiting they not only cost themselves more potential big hits that might’ve come out of it but they also wound up losing the magical pairing that had turned the rock world on its ear in 1948. Eddie Chamblee, bolstered by his success on those records and never a member of Thompson’s crew or The Sharps & The Flats to begin with, formed his own group in January 1949 and would go on to record with them. Left with no other choice Thompson found other horn players in an attempt to replicate the magic he and Chamblee had created together but oddly he wasn’t even brought back in the studio until April by which time the world had moved on – for all of them, Thompson, Chamblee and Miracle Records. Blue Dreams is a fitting title for the record that ends their collective momentum under decidedly ambiguous – and easily avoidable – circumstances, for it was while they all slept that they lost their hold on the ears of the rock fan who by now had plenty of other artists, records and emerging sounds to capture their attention. Leave a reply on "Sonny Thompson: “Blue Dreams”"